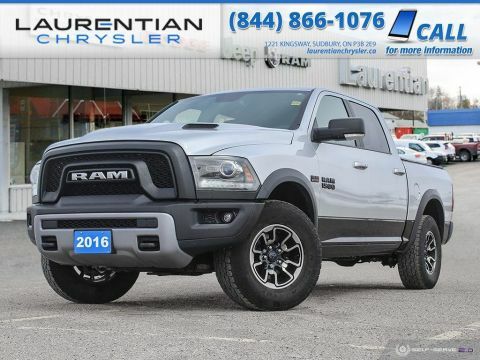 Pre-Owned 2016 Ram 1500 Rebel - NAV, BACK-UP CAM, BLUETOOTH, HEATED SEATS!!! From home to the job site, this Black 2016 Ram 1500 Rebel muscles through any terrain. The heavy duty Regular Unleaded V-8 5.7 L/345 engine brings stump pulling torque so you're always prepared. Own the road in this vehicle. It comes equipped with these options: Hands-Free Comm w/Bluetooth, TRANSMISSION: 8-SPEED TORQUEFLITE AUTOMATIC (DFK) -inc: Electronic Shift, REMOTE START & SECURITY ALARM GROUP -inc: Remote Start System, Security Alarm, RED/BLACK, HEAVY DUTY VINYL BUCKET W/EMBOSS TREAD PATTERN, REAR WINDOW DEFROSTER, RADIO: UCONNECT 8.4 SXM/HANDS-FREE/NAV -inc: GPS Navigation, Media Hub w/SD/USB/AUX Input Jack, 8.4 Touchscreen, Remote SD Card Slot, QUICK ORDER PACKAGE 26W REBEL -inc: Engine: 5.7L HEMI VVT V8 w/FuelSaver MDS, Transmission: 8-Speed TorqueFlite Automatic (DFK), Bright Dual Rear Exhaust Tips, Flat Black 5.7L Hemi Badge, Flat Black Ram 1500 Badge, Ram Glove Box Badge, PROTECTION GROUP -inc: Transfer Case Skid Plate, Front Suspension Skid Plate, POWER SUNROOF, and PARKVIEW REAR BACK-UP CAMERA -inc: Auto-Dimming Rearview Mirror. 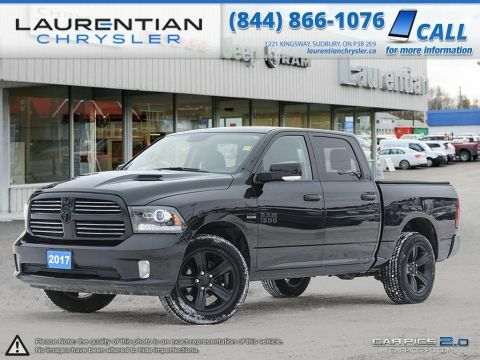 Treat yourself - stop by Laurentian Chrysler located at 1221 Kingsway, Sudbury, ON P3B 2E9 to make this truck yours today! No haggle, no hassle. About Laurentian Chrysler: As one of the largest pre-owned dealership in Northern Ontario we pride ourselves on customer satisfaction and courteous service providing market value pricing on each and every vehicle. This means that we have already done all of the research for you so you know with certainty that you are getting a great deal. ALL of our vehicles go through a 120-point Laurentian Certified Used Vehicle Inspection. We provide full disclosure on all vehicles and at your request we will provide CarProof vehicle history documents. We are automotive financial experts and work with all major banks and Honda Financial Services daily. Give us a call today to find out more about our low finance rates! 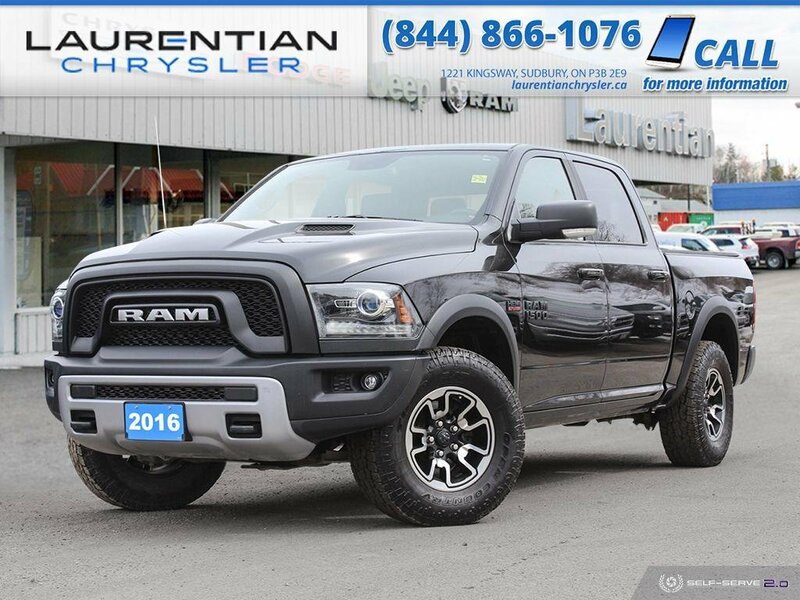 From home to the job site, this Black 2016 Ram 1500 Rebel muscles through any terrain. The heavy duty Regular Unleaded V-8 5.7 L/345 engine brings stump pulling torque so you're always prepared. Own the road in this vehicle. It comes equipped with these options: Hands-Free Comm w/Bluetooth, TRANSMISSION: 8-SPEED TORQUEFLITE AUTOMATIC (DFK) -inc: Electronic Shift, REMOTE START & SECURITY ALARM GROUP -inc: Remote Start System, Security Alarm, RED/BLACK, HEAVY DUTY VINYL BUCKET W/EMBOSS TREAD PATTERN, REAR WINDOW DEFROSTER, RADIO: UCONNECT 8.4 SXM/HANDS-FREE/NAV -inc: GPS Navigation, Media Hub w/SD/USB/AUX Input Jack, 8.4 Touchscreen, Remote SD Card Slot, QUICK ORDER PACKAGE 26W REBEL -inc: Engine: 5.7L HEMI VVT V8 w/FuelSaver MDS, Transmission: 8-Speed TorqueFlite Automatic (DFK), Bright Dual Rear Exhaust Tips, Flat Black 5.7L Hemi Badge, Flat Black Ram 1500 Badge, Ram Glove Box Badge, PROTECTION GROUP -inc: Transfer Case Skid Plate, Front Suspension Skid Plate, POWER SUNROOF, and PARKVIEW REAR BACK-UP CAMERA -inc: Auto-Dimming Rearview Mirror. 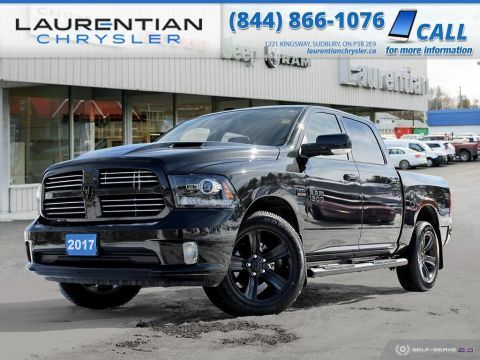 Treat yourself - stop by Laurentian Chrysler located at 1221 Kingsway, Sudbury, ON P3B 2E9 to make this truck yours today! No haggle, no hassle.